Milk chocolate melts - perfect chocolate for chocolate fountains, chocolate covered strawberries and candy making! Try it in your favorite chocolate bark recipe! Delicious new flavor. Chocolate fountain ready, hardens quickly, great for dipping fruit, bacon, pretzels and perfect for all your candy making needs. Makes delicious chocolate bark! 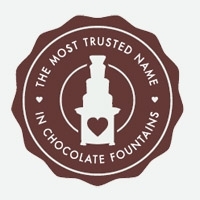 Sephra Milk Chocolate Melts are specially formulated for use in chocolate fountains, make the perfect dipping chocolate for all types of food items and are great for all your chocolate candy making needs. Chocolate melts harden quickly for confectioners who wish to have a chocolate coating when molding or dipping food items. Sometimes referred to as a compound coating, Sephra Chocolate Melts are made of similar ingredients as chocolate, however compound coatings contain greater than 5% vegetable fat substituted for traditional cocoa butter found in chocolate. Compound coatings also are made with cocoa powder instead of chocolate liquor. Confectioners often prefer compound coating due to its economical cost and since it does not require tempering as do cocoa butter based chocolate products. Best chocolate fountain chocolate EVER!